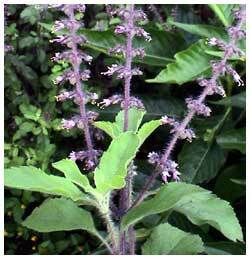 Description: It is an evergreen, strongly aromatic and erect herb having greenish to purplish appearance. The plant bears small, pinkish-white, bi-lipped flowers in compact terminal spikes. How to Grow: Due to its sacred and medicinal value, a large number of families in the country already keep at least one plant of tulasi in their houses. It can be planted in the ground or in a pot of 25-30 cm size. It is also planted in a special structure called ‘tulsi mada’ to bestow a special status to this plant. Care regime: It is a hardy plant and can survive moisture stress conditions for a few days. However, for optimum production of leaves, watering once in two days is adequate. The plant grows to become a compact bush and, therefore, does not need any specific trimming. Collection: Mature leaves from older stems can be plucked by hand.